Regardless of the Bryce Harper and Manny Machado madness, the Philadelphia Phillies remain on the hunt to improve other areas of the club. This week's mailbag deals with several questions regarding the starting rotation, bullpen projections, and Mike Trout. Don't let the snow this weekend keep you down for too long, a month from today will mark the Phillies' first full-squad workout in Clearwater. "When will we have an answer on Machado or Harper, the suspense is killing me!" - Jerome K.
It's killing everybody, Jerome. At this point though, I think it could be a couple weeks before we see progress. Though offers are believed to have been exchanged with both superstars, it's a smart move on their part to wait things out and see if another suitor comes along with a bigger briefcase of money. I do believe the Phillies will land one of the two (leaning Harper), but it may be Valentines Day before we know for sure. "Mike Trout, what about Trout coming to Philly. The Phils need to make that happen." - Ed M.
The one thing that's gotten under my skin a bit more this offseason than the misleading reports on Harper and Machado is the hoopla connecting the Phillies and Trout. Yes, he's a generational talent and it would be fantastic to have him here in Philadelphia, but other clubs exist across Major League Baseball and they are going to do whatever they can to lure him to their city. The fact he's a local boy is great, but to act as if there's going to be some "hometown" discount or to insinuate that he "must" play for the Phillies is bonkers. For now, he's in Anaheim. The Phillies will do their homework and make a serious play, but only if it makes sense given other commitments. Remember, you're eventually going to have to pay Aaron Nola and Rhys Hoskins, plus Harper or Machado, and who knows how different the roster will look in two years. "If the season were to open today, is [Seranthony] Dominguez or [David] Robertson the closer." - Ramon V.
There's really no answer to this question. We witnessed last season how manager Gabe Kapler believes bullpen pieces are interchangeable. He'll play the hot hand and look at the matchups. I've contended, and so did some members of the bullpen last year, that pitchers perform better when they know their role ahead of time, but Kapler seems content on using a committee at the backend of the bullpen. "Are the Phillies still looking to upgrade the starting rotation? I just don't have faith yet in some of these arms." - Khalid Z. Yes, that remains on their priority list. Team president Andy MacPhail even said it himself at the end of the last year, that it would be tough to envision the club opening camp with the same rotation in place that opened 2018. If the season opened today though, the Phillies rotation would be Nola, Arrieta, Velasquez, Pivetta, and Eflin, which is essentially the same rotation from a year ago. The club has been linked to free agent Dallas Keuchel as a potential addition, or the club could trade for a backend option. "Who is 2019 a make or break season for?" 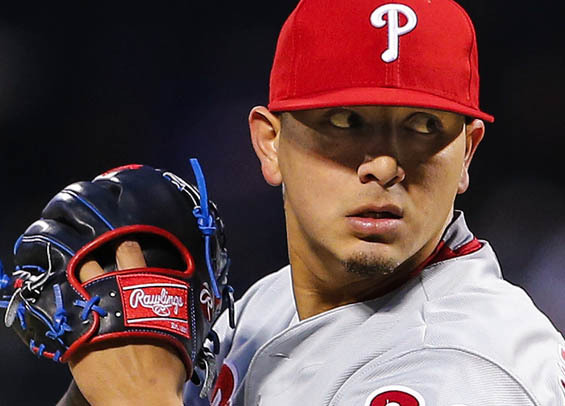 - Gary Q.
I thought last year was going to be defining for Vince Velasquez, but I still feel there's questions surrounding if he's better suited for the rotation or the bullpen. Those questions will certainly arise again in 2019. Offensively, I think Odubel Herrera has a lot to prove. Is he an All-Star caliber outfielder that can control his mind, or is he an inconsistent contributor that continues to befuddle the organization and the entire Philadelphia fan-base? If he's here come Opening Day (trade bait if Phils land Harper?) he'll certainly be under a microscope.